I made these yesterday! They are very cute and I plan to use them for a of couple projects one being head bands for my young friend. The one with the reddish color is the one closest to the bees I have in my area. 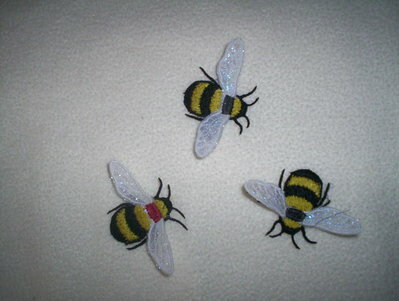 These are stand alone with the body being FSL and the wings stitched on organza and angelina fiber. I love these! May I ask where you got the pattern? They look awesome!! I too went to the site in the link and found the bees to be longer and thinner. How did you get yours to have the nice plump rears? This is how they stitched out. i think the photo is misleading. Okay, because I love yours. Thank you for answering me. I think they look longer in the tutorial because she has bent them slightly around the brooch clasp. They look so realistic! What a fun project! Where did you get the pattern for these? I love your bees, but unfortunately the company in the link has other bees with longer bodies. I prefer yours.